Pureed pork for babies? New study touts benefits of introducing meat early. Buzz60 A new study shows that babies fed pureed pork and beef, beginning at 5 months, grew nearly an inch more than babies eating dairy. But should parents feed babies pureed pork chops and steak? Minghua Tang, the lead researcher of the University of Colorado study, said parents typically don't consider red meat as a first food for their babies. ► MORE: These baby foods and formulas tested positive for arsenic, lead and BPA in new study Francis plans to follow a traditional food plan, giving her baby cereal, vegetables and fruits, then meat, even though recommendations around when to introduce different foods have relaxed. "Feed them what you want, just wait until 6 months," Francis said. "The important thing is to introduce a wide variety of fruits, veggies and protein sources." "But introducing meats would be good for that," he said. Parents increased their babies' protein consumption 50 percent, from 2 grams per kilogram of weight per day before the study to 3 grams, during the seven months of research. "It’s the same thing with meats," said Levin, whose Washington, D.C., group promotes a plant-based diet. Francis said parents should expose their babies to a variety of healthy foods. 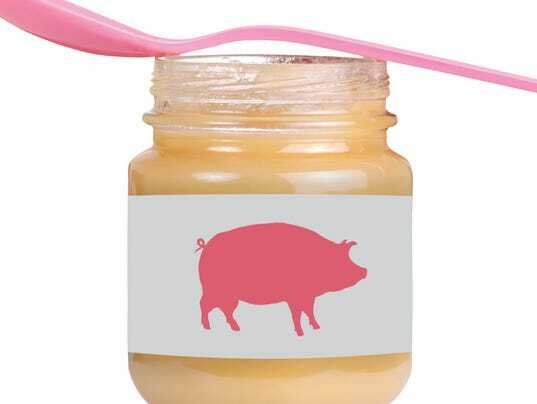 A new study shows that babies fed pureed pork and beef, beginning at 5 months, grew nearly an inch more than babies eating dairy. But should parents feed babies pureed pork chops and steak? Expert opinions vary. “I would not make meat one of the first foods I provided my child,” said Sarah Francis, an Iowa State University nutritionist and mom of a 5-month and 2½-year-old. Francis said she’s concerned 5 months is too early to feed meat to infants whose digestive systems are still developing. The American Academy of Pediatrics recommends that breast-milk or formula be a baby’s sole nutritional source for about 6 months, and a primary source through the first year. Minghua Tang, the lead researcher of the University of Colorado study, said parents typically don’t consider red meat as a first food for their babies. But, she said, parents should “not restrict your options to cereals,” based on the study’s outcomes that showed meat-fed babies grew at a faster rate and without risk of being overweight. “We’re not telling parents to load an infant’s diet with red meat, but to consider animal-sourced protein as an option,” said Tang, adding that the study’s sample size of 64 was small and requires additional research. Half the babies were fed dairy protein and half, red meat. The study was supported in part by the National Pork Board.